Alice in Chains kept hard rock alive in the face of the 90s alternative explosion. The Seattle band was certainly as eclectic and as experi­mental – as alternative – as the best of them, but never lost its rocking edge, thanks in large part to the crunchy guitar work of Jerry Cantrell. They succeeded in bringing the her­itage of the Stones, Van Halen, and AC/DC into the grunge arena, and in having it seem fresher and more dangerous than ever – which is exem­plified on 1996’s Alice in Chains album, and the standout cut Over Now. Over Now began life as a home demo by Cantrell and was brought to the band, along with “Grind” and “Again,” shortly before the sessions. The track was fleshed out and re-recorded with electric and acoustic layering, and remains one of the Alice in Chains mainstays. Over Now was recently included in their MTV Unplugged set, which is soon due for release. By playing the Gtr. 1 riffs and rhythm figures of this transcrip­tion on an acoustic guitar, you can automatical­ly create the unplugged version for yourself. Open D tuning, a half-step lower. Begin by tuning all six guitar strings down a half step. Next, lower the 1st string a whole step to Db, the 2nd string a whole step to Ab, and 6th string a whole step to Db. Finally, lower the 3rd string a half step to F. Your guitar should sound like an open Db major chord. This tuning is used by Gtr. 1, the primary acoustic, and Gtr. 2, the pri­mary distorted electric. A third distorted elec­tric guitar, playing solos and fills, uses standard tuning, down a half step. 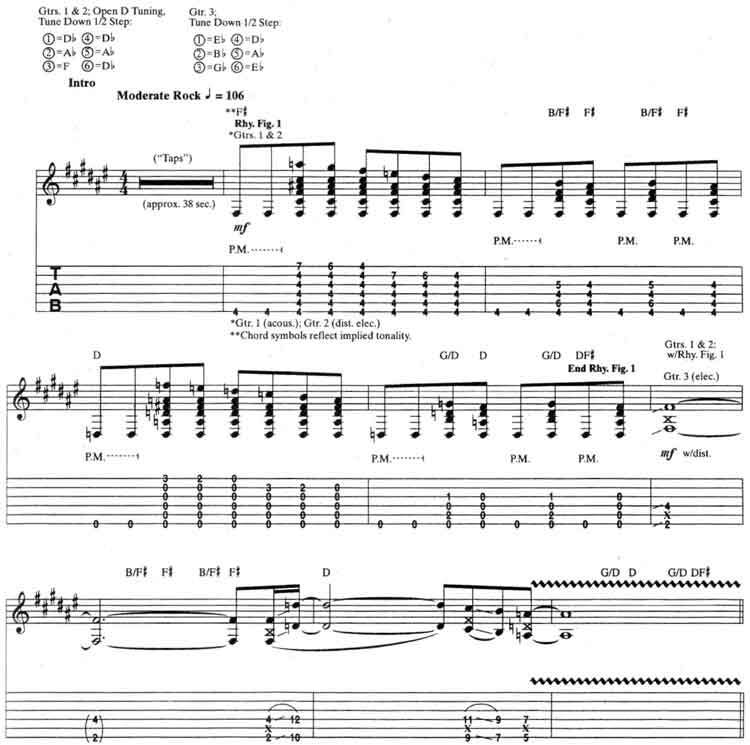 The main riff, found in the intro and verses, is a heavy four-measure rhythm figure with an alternative edge and unusual chords. Played with a fat, distorted electric and doubled with acoustic, Rhy. Fig. 1 comes off like a grungy version of a Keith Richards’ riff, rendered with a 90s spin and a heavy rock menace. Let’s take a closer look. The principle of using the tuning to generate simple, rocking chord patterns is the same as Richards’, though here a lower-pitched and more sinister result is achieved. The open D tuning provides the barred major chord wher­ever you lay your index finger. Jerry lays it at the fourth position for the first half of the riff, producing a one-finger F# major chord. Over this simple position, he plays a mildly dissonant, descending melody on the top two strings. Note that this melody is based on a single, simple melodic shape played initially on the 1st string and then on the 2nd string [Fig. 1]. In measure 2 of the riff, we find a heavier, lower-register version of the classic I-IV pattern so closely associated with Keith Richards (see Start Me Up guitar tabs elsewhere in this site). Notice the index finger barres across the neck for the I chord, F#. Also, the IV chord is formed by adding the second and third fingers to the barred shape. The trick is to keep the first barred shape fret­ted under both chords [Fig. 2]. The same riff pattern is played in the open position, D major, for the second half of Rhy. Fig. 1. Throughout both sections of the riff, the 6th string is palm-muted for a chunky, percussive effect. The same chords and patterns are used for Rhy. Fig. 2, a longer variant of the riff. The chorus, with its moving parallel 7th chord progression of A7-G#7-B7, conveys an edgy Beatles vibe. The open tuning yields these easy, two-finger 7th shapes, which Cantrell moves around the fretboard like power chords [Fig. 3]. The interlude provides a real contrast in mood and sound with a shift to a half-time feel and a more orchestral texture. Gtr. 1 plays Rhy. Fig. 3, a droning, arpeggiated F#m-D progres­sion employing ringing open strings and unusu­al voicings, again made available by the open timing. Note the subtle ascending melody run­ning through the progression on the 1st and 2nd strings, and the common tones and shapes in both F# minor and D. The chords in D are prac­tically identical to those in F# minor, with the exception of the D bass notes [Fig. 4]. Over Rhy. Fig. 3, Jerry plays a heavily distorted but melo­dious solo which is more textural than lick-ori­ented. His neo-psychedelic lines are diatonic, but filled with string bends. They’re based on the F# natural minor scale (or Aeolian mode): F#-G#-A-B-C#-D-E. He kicks on an octave box in mid-solo which adds an even darker quality to the guitar and pushes his elastic lines further into the mix. Notice that Jerry recalls the sim­ple, fuzzed-out melody from between the earlier verses as a recurring motive to return to the fol­lowing verse. The half-time feel and textural sound of the interlude are reprised in the outro. It’s a part of Alice in Chains Over Now guitar tab and sheet. © 2012 - 2019 TabsClub Powered by TabsClub 42 queries in 0.409 seconds.